Over the years in this blog I’ve obliquely referred to where I work as “the world’s busiest airport”. Most of my friends know that I’m referring to Hartsfield-Jackson Atlanta International Airport (H-JAIA) in Atlanta. The city of Atlanta is often referred to as “the ATL” but the term ‘ATL’ is actually the International Air Transport Association code that identifies H-JAIA in airline ticketing, reservation and baggage handling systems. When your flight destination is Atlanta the ticketing agent slaps a big ATL tag on your luggage to let the baggage handlers know where it needs to go. The younger generation in Atlanta has latched onto the term “the ATL” to describe their city, and I think it’s an interesting way of acknowledging the part the airport has played in the growth of the Atlanta region over the past 30 years. A lot of folks get confused when they think of H-JAIA. Some think it’s the world’s largest airport. It’s not – far from it. Lots of other airports occupy more ground. H-JAIA’s claim to fame is that for the past decade or so it has been the world’s busiest civilian passenger airport. As of this date H-JAIA is serving over 250,000 traveling passengers per day. That’s more passengers per day than many airports handle in a week, a month, or even a year! But how did H-JAIA get to where it is today? You don’t just build an airport and a quarter million passengers magically appear. The story of Atlanta’s airport is the story of concerted efforts on the part of a succession of mayors, starting with William B. Hartsfield and extending right up to today’s mayor, Kasim Reed, to build, promote and maintain the city’s airport as an engine of economic growth for the Atlanta region and the entire southeastern United States. But growth means construction and expansion, and that’s why we are here today. 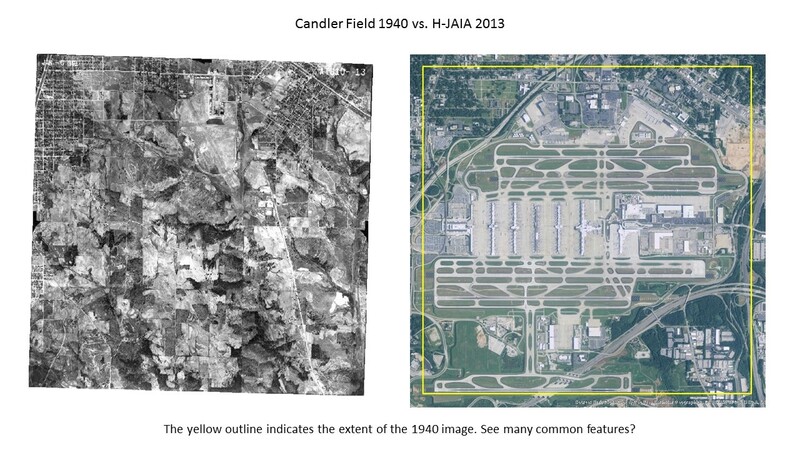 One of my jobs at H-JAIA is managing the airport’s aerial imagery program. In fact, before my team came on-board in 2007 there was no formal aerial imagery program. 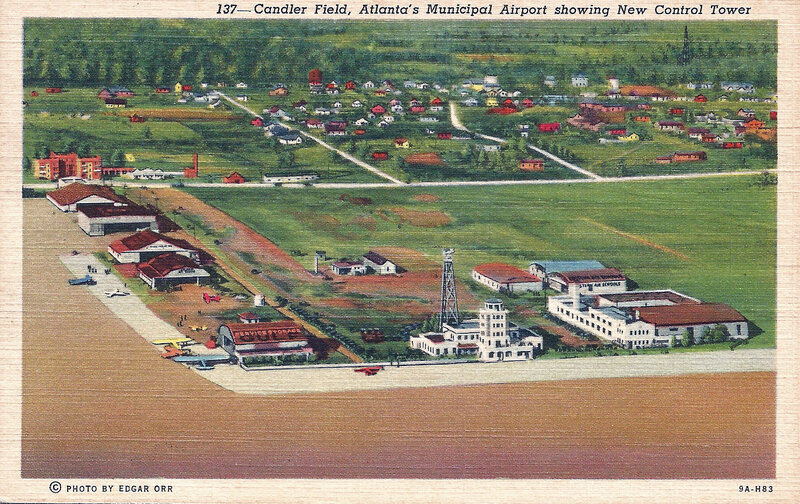 Aerial coverage of the airport was occasionally flow by government agencies like the US Geological Survey or the Soil Conservation Service, and in later years by contractors working large projects at the airport, but there was no Atlanta airport-managed and funded effort to acquire standard aerial imagery for use in the airport’s CAD and GIS systems. The engineering and design staff at the airport just relied on hand-me-downs and took whatever imagery they could get. Once we got the aerial imagery program in place (we now have the airport flown once a year for orthorectified coverage at high and medium resolutions) staff at the airport started asking if it would be possible to ‘register’ successive years of imagery in an effort to track the changes that have taken place at H-JAIA. I was intrigued by the request. We had a small but growing catalog of aerial images and I thought it would be fun to take on the challenge. A persistent rumor among many of the long-time employees in the airport’s planning & development division was that the airport got its start years ago as a racetrack. Now, nobody could define what ‘years ago’ meant. Some said maybe 50 years ago, others said 75. They just knew it was a long time ago, before they started work at the airport. In addition nobody could tell me precisely where this racetrack had been located. They only knew it had to be somewhere on the north side of the airport property since the airport’s growth over the decades was a steady march from north to south. Sadly, decades of airport expansion had obliterated all traces of it. 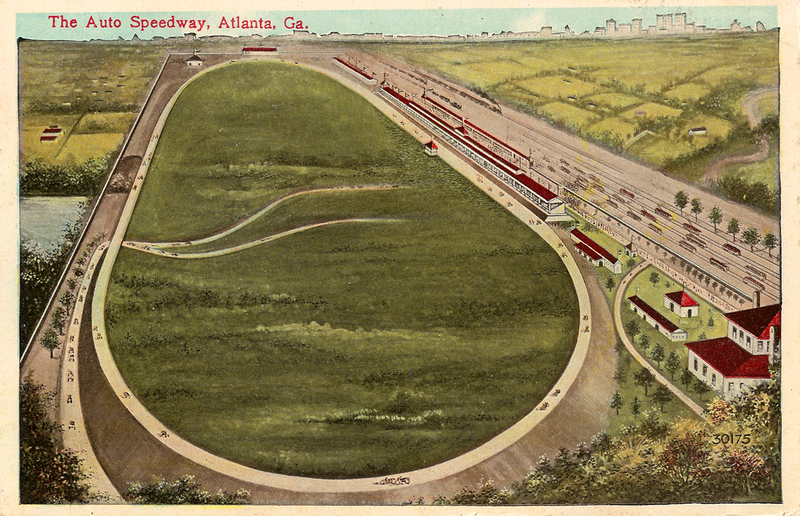 Some folks offered up old postcards and oblique aerial photos that depicted the race track. Clearly it had once existed, but where? 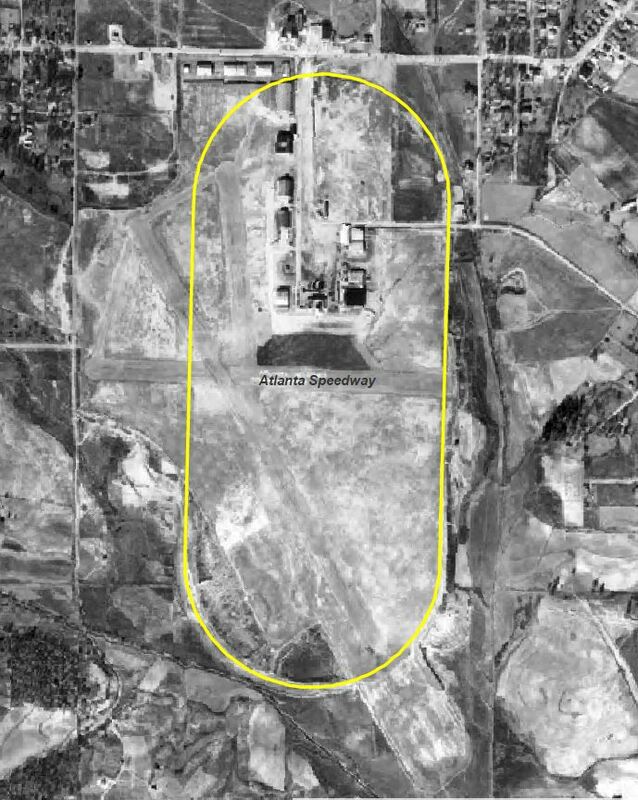 Oblique aerial photograph of the Atlanta Speedway race track taken around 1919 and looking to the northeast. OK, there clearly had been a racetrack, but where was it in relation to the modern airport? By this time I was getting a good bit of help. Several co-workers – Bill Beckwith, Dottie Gandee and Talley Jones – all aviation history buffs, started digging through their resources and finding interesting tidbits. 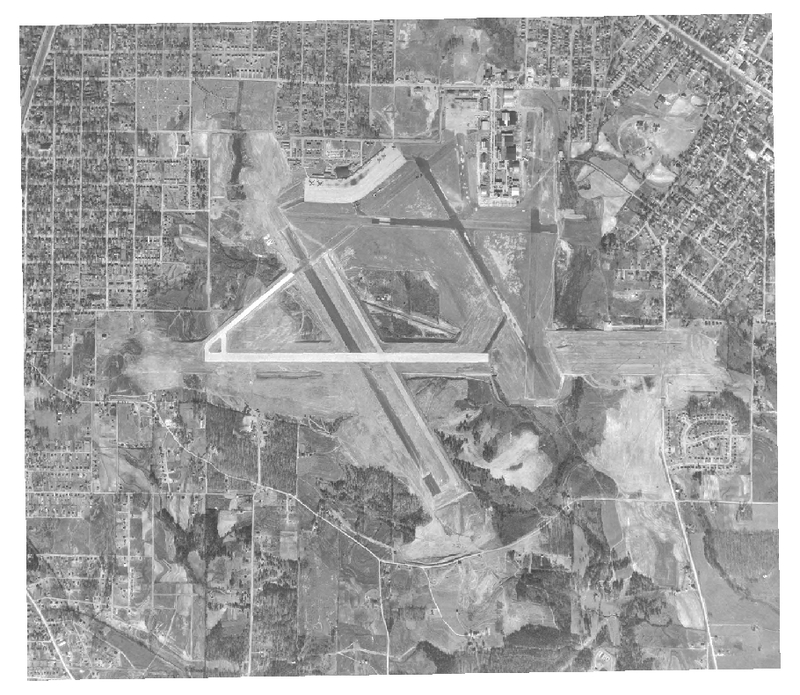 One day Talley came to me with an aerial photograph of the airport taken in 1940 by the US Soil Conservation Service. It was an ‘ah-ha!’ moment. There in the upper center of the photo was the clear outline of remnants of the racetrack along with the early runways and taxiways. But just as important, the photo also showed street intersections in the surrounding communities of College Park and Hapeville. These street intersections would prove critical to ‘registering’ or georeferencing this aerial to more recent airport images. Soon more aerial photos came my way. 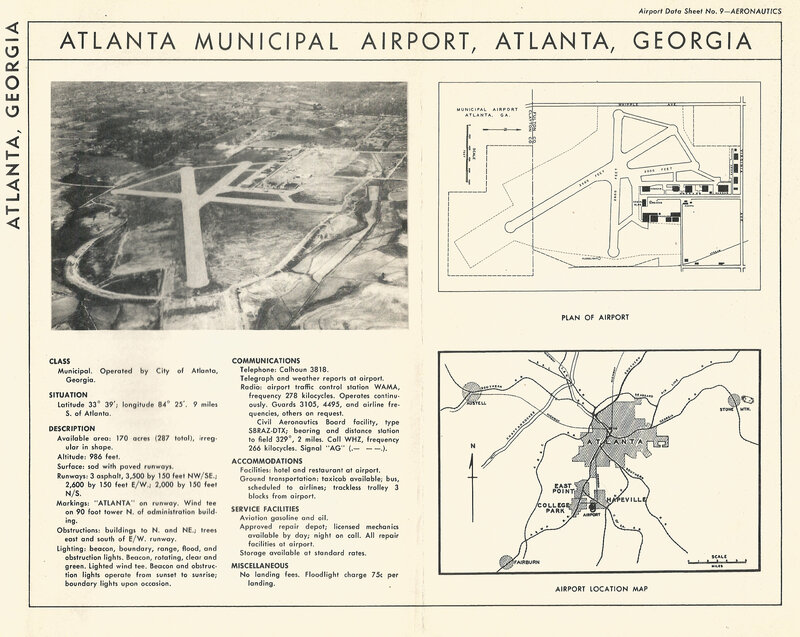 In particular the 1949 aerial shows the growth of the airport spurred by the rapid expansion of civil aviation after WWII and Atlanta’s early moves to establish itself as the major hub airport in the southeast. I found myself with great aerial images separated by a wide gulf of time and change. I had our modern, highly accurate orthorectified aerial images tightly tied to the Earth’s surface and old, historically significant aerials with no ties to anything. It was time to get to work and georeference the old to the new. 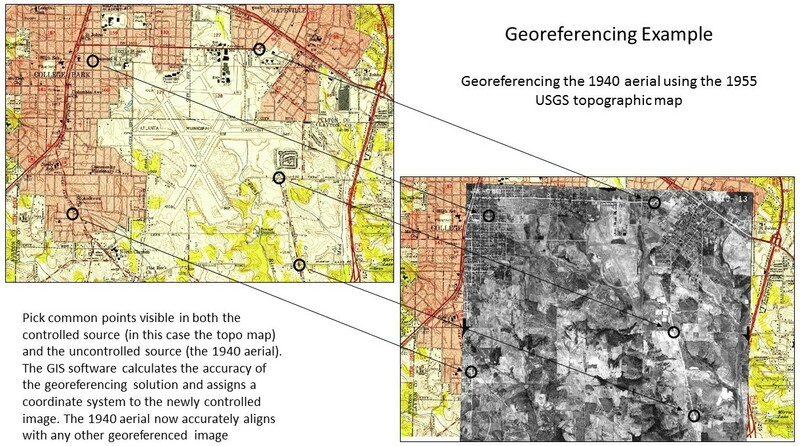 The process of georeferencing is easy to understand. You have two images, one of which is already georeferenced, or ‘tied’, to the Earth’s surface. Using common tie points – things like road intersections or key natural features seen in both images – you use the controlled (georeferenced) image to bring geographic values (x & y) onto the same points in the uncontrolled image. When the process is complete the uncontrolled image is now georeferenced and will automatically line up with any other georeferenced image or map. An accurate georeference process requires the use of several common tie points evenly distributed around the images. For example, if all of your common points are clustered in the upper left of your images then the accuracy of the georeferencing process will rapidly fall off as you move towards the lower right of the uncontrolled image. This is precisely the issue I ran up against when trying to georeference the older 1940 and 1949 aerials to our modern orthorectified images. As the airport grew to the south it wiped away all traces of the old road patterns seen in the southern portions of the old photos. While there were road intersections in the upper parts of the old aerials that were still visible in the current images that made good tie points, there were no common points available as we moved south, away from the Hapeville and College Park areas. 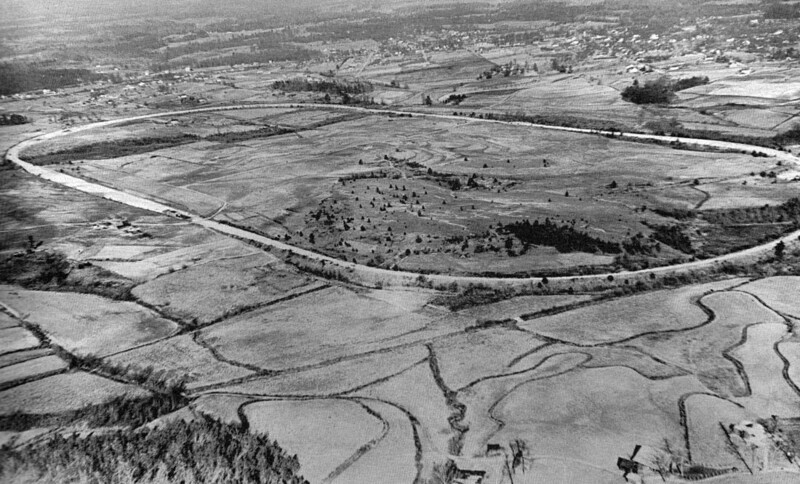 Atlanta’s airport had literally bulldozed away entire communities, farms and roads as it expanded southward. Where there were road intersections, houses, churches, farm fields and fencelines in the 1940 and 1949 aerials there was nothing but runways and taxiways in the modern images. I was stuck. Then one day I was looking through the US Geological Survey’s (USGS) on-line historical topographic map library and found the 1955 1:24,000 scale topographic quad sheet for East Point, GA. These historical topo sheets are high quality scans of the original paper maps and have been georeferenced. As I looked at the 1955 quad sheet and the 1940 & 1949 aerials I realized I had found my Rosetta Stone. 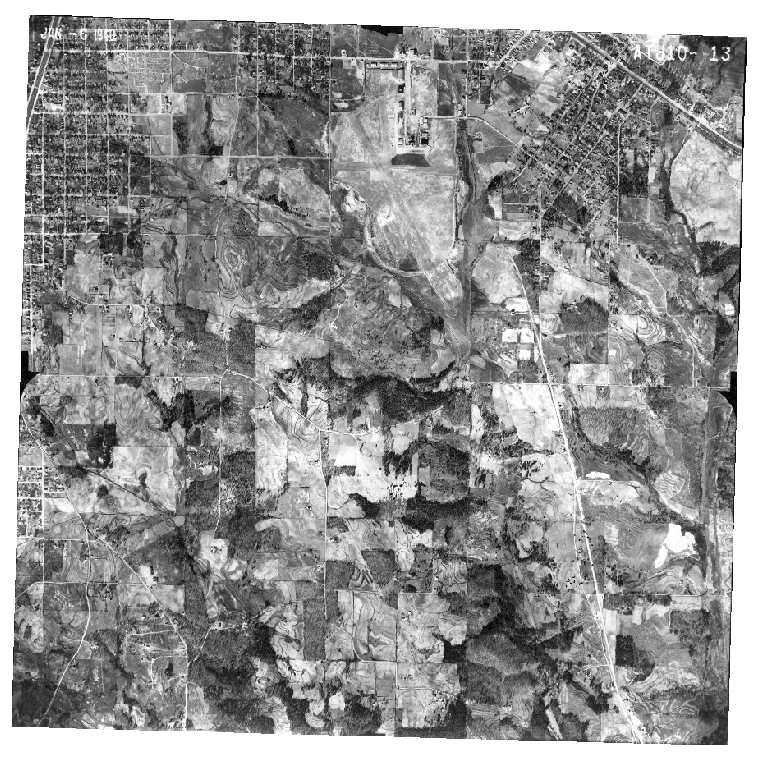 The 1955 topographic map and the aerials all shared evenly distributed tie points and I could use the map to accurately georeference the images. While this 1:24,000 scale topographic map is not a highly accurate control source, it was more than good enough for this job. Here’s a graphic that shows how the georeferencing process works. The process is handled by our ArcGIS desktop software which offers powerful tools to georeference a wide variety of maps, images, charts, CAD drawings or any other data that can be tied to a ground location. So let’s get back to the original question – where was this racetrack? Well, now that we had the 1940 aerial georeferenced it was a simple matter of tracing the racetrack from the aerial and creating a new GIS data layer that could be used in a wide variety of maps. Mystery solved! But what to do with all this great information? It’s a shame to keep all this airport history locked up on a hard drive. Just a few years ago if someone wanted to view our historical imagery we were limited to printing paper maps or relying on emerging and not-yet-mature web mapping technologies to put this information out on the Internet. But times have changed, and with modern image caching technology and cloud-based web mapping platforms we can share this web map to the world. 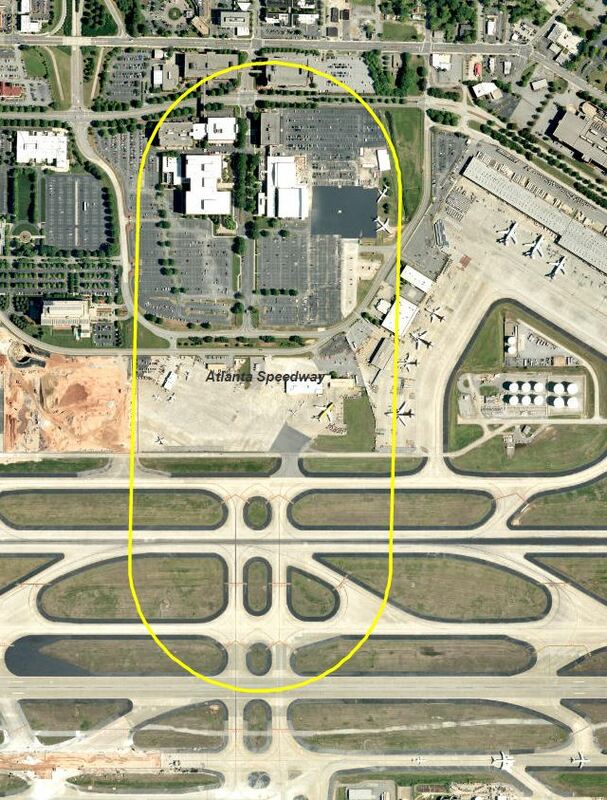 So click the web map icon below and explore the history of Hartsifield-Jackson Atlanta International Airport as told through aerial photography and maps. 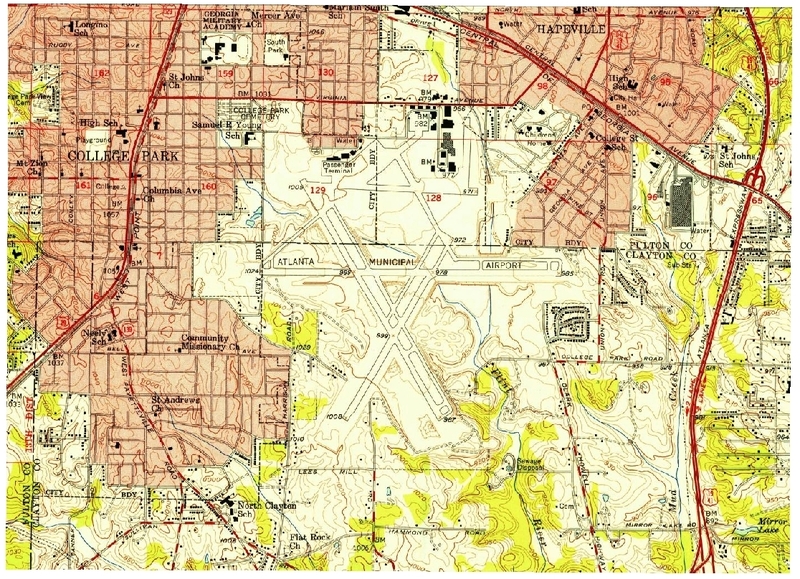 The available map layers start with a 1936 airport development plan drawn up by the Works Progress Administration and carry through to our 2014 aerial basemap. The web map was built using ESRI’s Web App Builder technology and all data is hosted via the airport’s ArcGIS Online website. If you have any questions or comments please feel free to add them to the comments list below. This post is about the history of the airport as told through aerial photography. For a more in-depth look at Atlanta’s extensive aviation history I invite you to visit David P. Henderson’s excellent Sunshine Skies website.